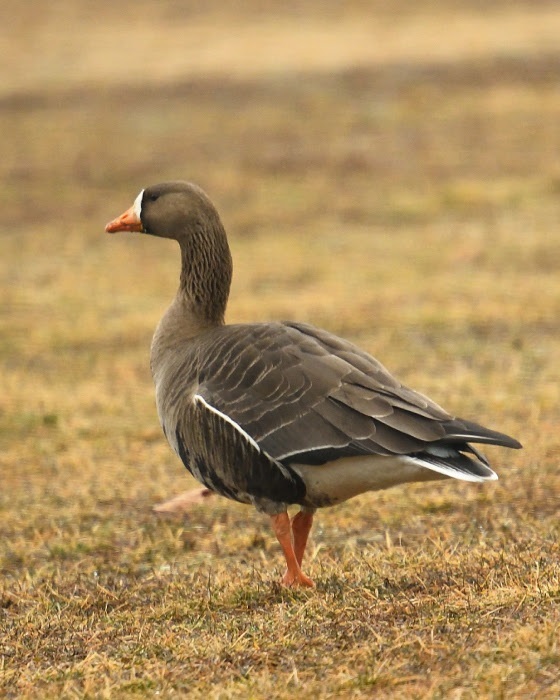 A white fronted goose, rarely seen west of the Mississippi river, enjoys grazing on central New Jersey grass. Long before President Eisenhower signed the interstate highway bill into law in 1956, The Atlantic, Central and Pacific flyways served as major superhighways for migrating birds. The primary exit ramps for these super flyways are the rivers which radiate out along the north-south migration routes to distribute the migrating birds far and wide. New Jersey sits directly on the Atlantic flyway, bounded by the Delaware River and the Atlantic Ocean. Within the state’s interior flows the Raritan River, the longest inland river in the state which serves as a major migratory off ramp. The confluence of the North and South Branches may then be considered the prime visitors center and rest area, as birds funnel down the Raritan to disperse inland. Look at a colored distribution map in any bird book and discover that many species are specific to defined regions. You might not expect to see a rufous hummingbird from the northern Pacific coast, sipping nectar in central New Jersey. However, in 2012, a rufous hummer showed up in our midst and stayed the winter, surviving by the kindness of human intervention. Marlene Scocco reached out to this wayward hummer providing food and shelter, causing a stir in the birding community which gratefully documented this migratory anomaly. Checking the records for rare hummingbird visitors to New Jersey, other hummer species like the calliope and green violet eared were also documented. How these birds end up on the east coast is pure speculation. The point is they do and they are here for you to discover. Feathered visitors from faraway places to the Raritan valley are not just limited to hummingbirds. 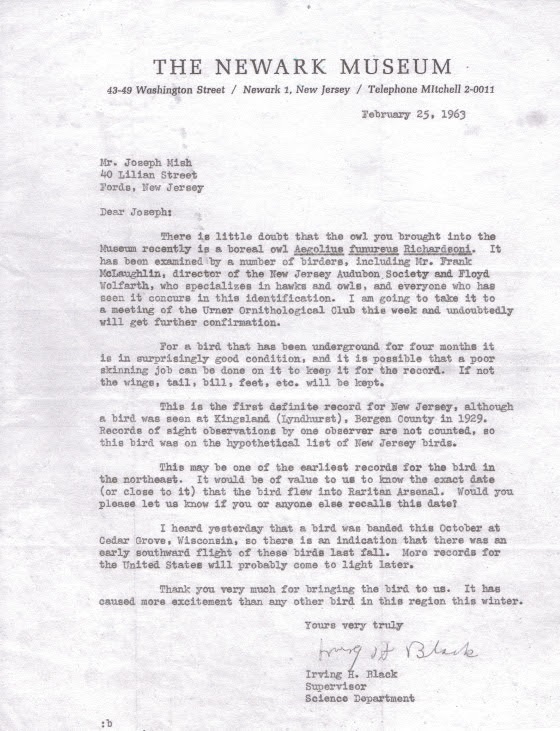 In 1963 I was handed a small owl taken from a guard tower in the Raritan arsenal. It died shortly after. I mentioned this to a friend’s dad who was an avid bird watcher. Told him it was a boreal owl. He smiled and assured me it was probably a saw whet owl. We ended up at the Newark Museum and showed it to the curator, Irving H. Black. Confusion ensued and experts from across the country were consulted. The experts concluded the bird was indeed a boreal owl. It set a new record for the southernmost sighting in the US. The boreal owl, briefly known as the Richardson owl, is a fulltime resident of the coniferous forests of the arctic region. The owl is preserved as a study skin at the Newark museum. The visitors keep coming. In mid March of this year I noticed an inconsistency in the color pattern of a flock of grazing geese, as I drove by. The geese blended together in one giant mosaic, painted with repetitive splashes of black, white and brown. I pulled over and focused on the colors that didn’t belong. I was looking at a white fronted goose, another bird that was obviously unfamiliar with distribution maps found in bird books. The white fronted goose is rarely seen east of the Mississippi river, the main artery of the central flyway. To see a white fronted goose in central NJ is therefore an unexpected surprise and evidence that nature has a tendency to violate scientific generalizations. 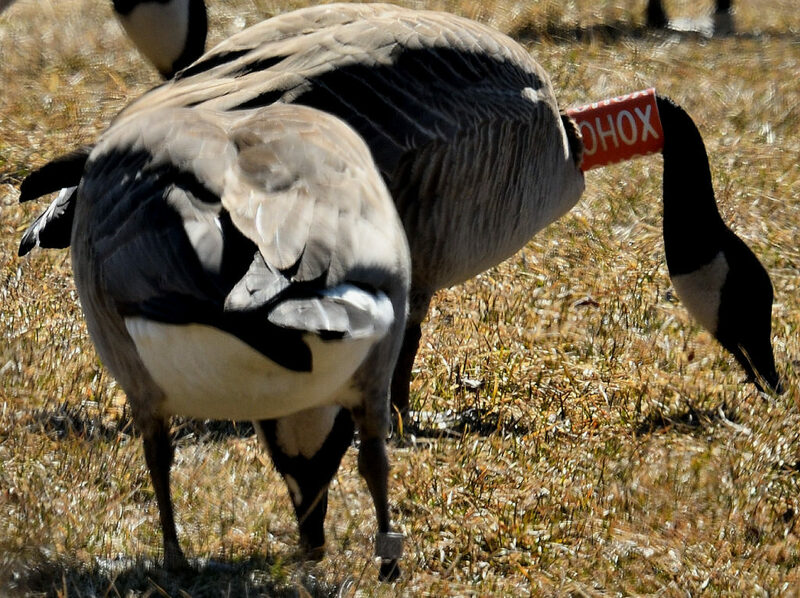 The following week, a Canada goose with an orange and white collar marked OHOX was observed along rt 22. It also had a metal band on its left leg. 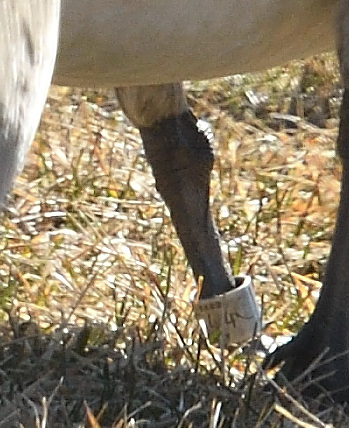 While editing images, I was shocked to see the goose standing next to it also wore a leg band. 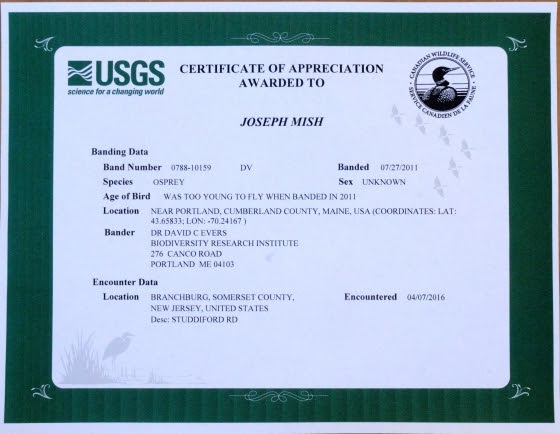 Reporting this goose to the USGS bird banding website I was provided with a certificate noting that the goose was a female, banded as a flightless gosling near Varennes, Quebec, Canada on the Fourth of July, 2016. The spring migration is now in full swing. And along with colorful warblers, ruby throated hummingbirds, woodcock and osprey, come the errant travelers. Diverging from their evolutionary migration patterns, these intrepid winged visitors explode the myth that, “birds of a feather stick together”. Migrating birds that nest in our region, along with birds just passing through, are now appearing along our waterways. The confluence that forms the Raritan River is the staging area that hosts a feathered extravaganza of unimaginable variety. Author Joe Mish has been running wild in New Jersey since childhood when he found ways to escape his mother’s watchful eyes. He continues to trek the swamps, rivers and thickets seeking to share, with the residents and visitors, all of the state’s natural beauty hidden within full view. To read more of his writing and view more of his gorgeous photographs visit Winter Bear Rising, his wordpress blog. Joe’s series “Nature on the Raritan, Hidden in Plain View” runs monthly as part of the LRWP “Voices of the Watershed” series. Writing and photos used with permission from the author. Contact jjmish57@msn.com. See more articles and photos at winterbearrising.wordpress.com.